Monmouth County: Sheriff Shaun Golden wants all Monmouth County residents to take the proper steps as hurricane season approaches. Hurricane season begins June 1 and lasts through November 30. In an effort to ensure the safety and wellbeing of residents during weather related events, the Monmouth County Sheriff’s Office, OEM, will once again take disaster preparedness a step further by assisting seniors throughout Monmouth County in the event of an emergency or disaster through the STORM program. 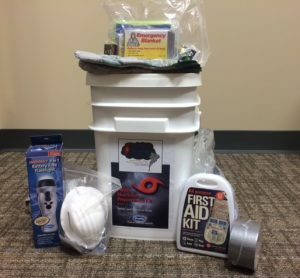 Seniors Taking on Readiness Measures, STORM, equips those who are among the most vulnerable population with emergency preparedness information, assists them in creating a family disaster plan, and, provides them with an emergency kit. “After Hurricane Irene and Superstorm Sandy impacted Monmouth County with mandatory evacuations and the need to shelter residents, it was recognized that many people did not have a family emergency plan. Thanks to our STORM program that has changed,” said Sheriff Golden. Once the booklet is completed, they are then provided with a free emergency supply kit, which includes basic necessities for use during an emergency. STORM programs can be scheduled by calling the Monmouth County Sheriff’s Office, OEM at (732) 431-7400. With hurricane season beginning June 1, the Monmouth County Sheriff’s Office is also urging residents to have emergency notifications and public safety information at their fingertips, through the Monmouth County Sheriff’s Office Application (app) for smartphones. The application is designed for Android and iOS platforms and can be downloaded for free. The app provides instant access to sheriff’s office related information, which includes real-time emergency notifications through its integrated push notification system that automatically displays the message on the phone. Users are able to be instantly alerted to weather, or other emergency related situations, from the Monmouth County Sheriff’s Office and the agency’s Office of Emergency Management. “It can be challenging during emergency situations to provide consistent, official messages to a large group of residents. In addition to social media and our website, this app is another tool that we utilize to keep the public informed,” said Sheriff Golden.